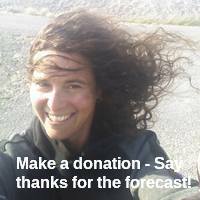 Tuesday: Three days of strong westerlies! Get the email free through the end of May – try it out! Click here. Thank you for using this forecast. I offer it freely so you can have more fun and plan your life. It does take significant time and energy to produce. If you find yourself using it often, or if you feel your life is enhanced by this information, please make a donation. Click right here to donate. I count on your support to pay my bills, and am deeply grateful to you for choosing to help support me. You can get this forecast via email by donation. The email subscription isn’t $99/year. Not $50/year. Donating $12.34 or more gets you on the list for 12 months. Don’t PayPal? Send a check to Temira @ PO Box 841 in Hood River. Thank you for your support and thank you for trusting my forecast. It’s Tuesday morning, and we’re looking at three very windy days coming up. The mechanisms driving the wind will be different each day, resulting in varying levels of gustiness, reliability, and longevity. That said, if you like very strong wind, you’ll be happy. If you don’t, wait until Friday for the best results, or stay in the far western Gorge under the clouds. For Tuesday, the pressure gradient started at .10 (pdx-dls), and models predict an increase to .15 later today. River temp is 54 degrees. Flow is 481kcfs, which I’d call “very strong”. Do be careful out there, and be prepared for a long, cold swim if your gear gets swept away. Keep an eye on others. Regarding the Rufus stretch of the river, 330kcfs seems to be about the max for decent conditions, meaning there’s an awful lot of water there right now. Okay, for Tuesday, we’ll see the wind start off in the 16-20 range. It’ll build to 24-28 between Viento and Mosier by late morning and fill in to Stevenson and The Dalles this afternoon. Areas east of The Dalles will likely be right under the heat low, and thus not windy, rendering the prior discussion of the Rufus current moot. Let’s call Rufus 50/50 for some low 20’s today. One thing to consider today is that the atmosphere will be somewhat unstable, leading to potentially gusty conditions on the river. High elevation instability combines with extremely stable low-level conditions on Wednesday for another round of strong westerlies. The day starts with 26-30 from Mosier to Arlington and ramps up to 30-35 from Bingen to Rufus. East of Rufus, the wind will probably max out in the 26-30 range. Models differ on the thunderstorm potential for Wednesday; the GFS is pretty outspoken, while the ECMWF is much less gung-ho. If thunderstorms do fire off, they are most likely east of Rufus, meaning you’ll want to stay west of there. The far western Gorge (Stevenson to Hood River) will likely stay cloudy on Wednesday, meaning the wind will be gusty, up-and-down, and less, perhaps in the 15-18 range. Thursday looks pretty awesome. The atmosphere stabilizes, high pressure builds off the coast, and the heat low sits in the desert. Clouds near Hood River early burn off by the afternoon, setting up a big Corridor day. Morning wind looks like 23-26 from Mosier to Arlington. Afternoon wind looks like 30-35 from Swell to Arlington. I think I’ll skip this today, just because. Have a wonderful day! For Tuesday, the mountain will be sunny. High clouds move in this evening with a slight chance of thunderstorms and sprinkles. The free air freezing level (FAF) will be 12,000′. Wind will be light and variable. Wednesday starts off with high clouds and a pretty sunrise. There’s a chance of thunderstorms during the day. FAF, 12,000′. Wind: NE 10 early, NW 5 in the afternoon and N 10 after midnight. Thursday looks sunny. FAF: 12,000′. Wind: N 10 early, WNW 15 in the afternoon, NW 20 overnight. It’s a sunny day, and it’s going to stay that way with a chance of high clouds late and a teeny-tiny chance of thunderstorms this evening. Temps will be in the low 60’s early and low 80’s later. Strong westerlies. No rainbows. Clouds push into Hood River Wednesday morning and maybe burn off in the afternoon. Temps will be in the mid 50’s early and low 70’s in the afternoon. Slight chance of thunderstorms. Very muggy. Very strong westerlies. No rainbows. Thursday looks partly cloudy in the morning and sunny in the afternoon. Temps will be in the mid 50’s early and low 70’s later. Very strong westerlies. No rainbows. The 44 Trails Association is reported that Knebal, Eightmile and Bottle Prairie are open. Surveyor’s still has trees down. Lake Branch Road is snow-covered from the top of the big climb to Lost Lake. Vista Ridge is open. Lewis River is open. The Cascadia Dirt Cup is in Post Canyon next Saturday, so you’ll want to make other plans. If you volunteer as race support, you’ll be helping the HRATS earn some cash. Hood River County has a work party on the Pinemont Loop (aka Kitchen Sink) next Saturday. Today’s events start with free meditation at Trinity Natural Medicine at 6:15 and free Qi Gong at noon. There’s free yoga at HAVEN at 5:30 tonight, meditation at Yoga Samadhi at 6:30, and a screening of the documentary the Reluctant Radical at 6:30. That one’s about a Gorge local who shut down an oil pipeline to raise awareness of climate change. If you’re interested in the Historic Columbia River Highway Trail project, there’s an open house tomorrow night at 6:15 at 601 State Street in Hood River. This weekend brings the Cascadia Dirt Cup Enduro race in Post Canyon on Saturday. You can avoid the crowds there by heading to other trails: Lewis River, Knebal, Eightmile, and bottle Prairie are all open and clear of snow. Wednesday: another round of strong westerlies.